Another Pinned It. Did It. guest post with Meg! These happy glasses make me smile. Would love to have some friends over for an evening of snacks + summer drinks (from the recipes Meg shares below) + some DIY fun! 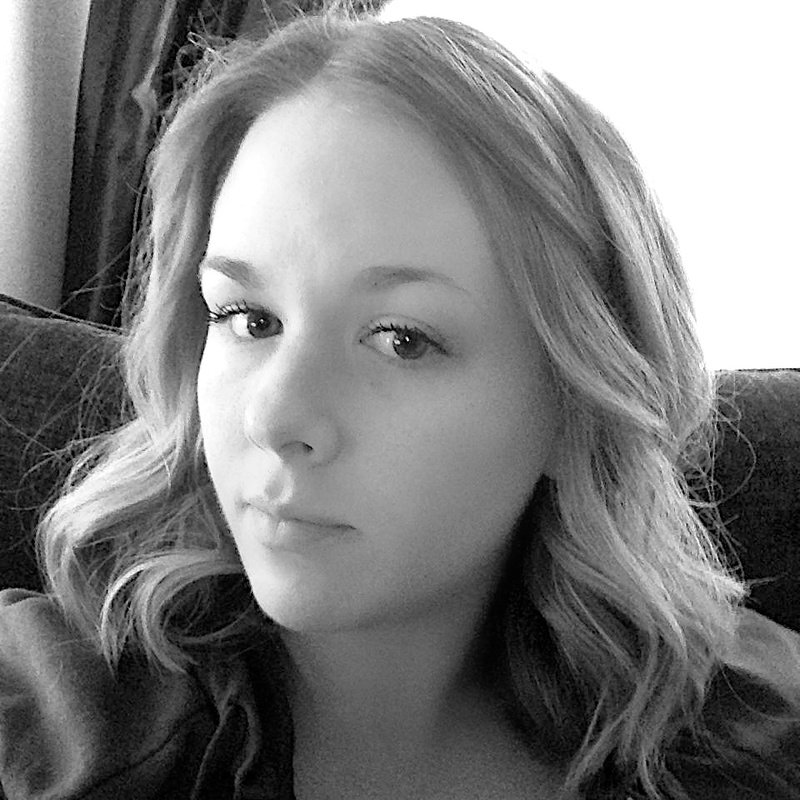 Read on for Meg's column. I pinned this DIY quite some time ago. It’s been in the back of my mind for months as a project I’d really like to try. So this weekend I stopped by the local dollar store and picked up some glasses to use and decided to give it a try. I used acrylic paints and an old paintbrush I had on hand. However after the fact, I discovered this paint that is specially designed for painting on glass and can be cured in the oven for a more permanent creation. 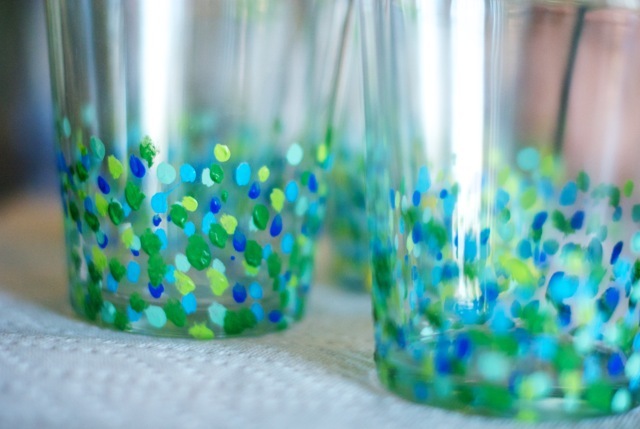 I’ve seen confetti glasses at places like Anthropologie and Crate & Barrel, and I am always drawn to the way they look like summer - the type of glass best for drinking iced tea or margaritas out of. Something that should be in-hand at a barbecue or on the back porch as the sun sets. June seemed like the perfect month to pull out the paints and give this project a whirl. The DIY itself is quite simple. 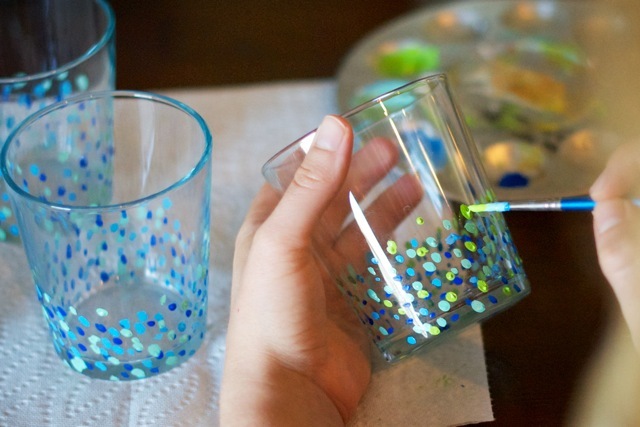 It really is as easy as dotting paint onto the side of a clean glass using a slightly heavier hand towards the bottom of the glass and lightening the touch as you work your way up. I started with the darkest blue first and worked my way towards lighter colors. 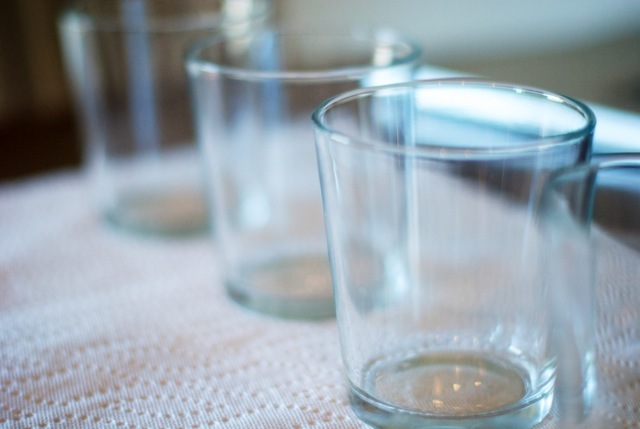 From what I’ve read, it’s important to seal the glasses after completing the painting in order to help prolong it’s life. However, even with a sealing, they are delicate and should always be gently washed with warm water and a soft sponge. 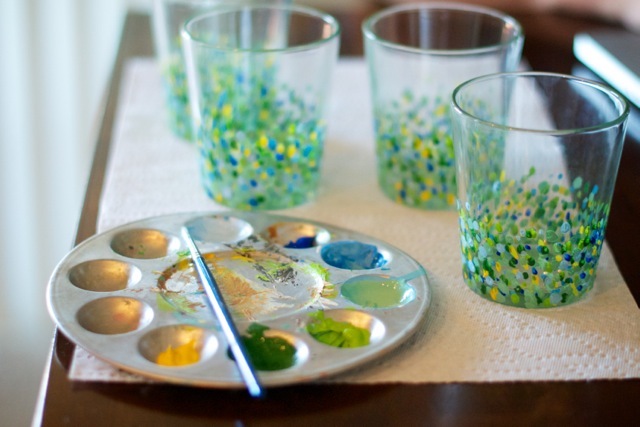 As I was dotting paint on my glasses, I was thinking about what a fun gift this would make for a teacher at the end of the year or a new neighbor welcome gift or a wedding shower gift for a couple. It’s a great handmade gift, yet it is forgiving on a tight budget. I added this pin to my “I Pinned It and Then Did It” board on Pinterest over the weekend and enjoyed looking back over all of the fun I’ve had since discovering Pinterest. What have you made from Pinterest lately? Tell us about it in the comments section or link to it for us to explore. Note from Liz: Over here in my corner, I'm trying to "use Pinterest for good." I really see it as a community of people trying to see the beauty and possibility in their lives. I'm adding a few new features here on my blog inspired by or directly about Pinterest as a way to invite others to look for this beauty within a social media community. I look forward to seeing how it all unfolds. Connect with me on Pinterest here. Read other "Pinned it. Did it." columns here.